Grab and go breakfasts that also doubles as an afternoon snack are big winners at my house. These banana muffins are great for breakfast but if you’re feeling like you need a little afternoon pick me up these muffins will fit the bill. Bonus is that they are only 125 calories! They are low in sugar and have only two tablespoons of butter in the entire recipe. Substituting applesauce for the oil/butter makes them healthier and really moist. Recently on my Facebook page I did an informal poll asking whether chocolate chips in banana bread was a yay or nay. I was surprised to see so many people are not fans of chocolate chips in their banana bread. Honestly I can’t blame you, chocolate chips in banana bread aren’t really my thing either. 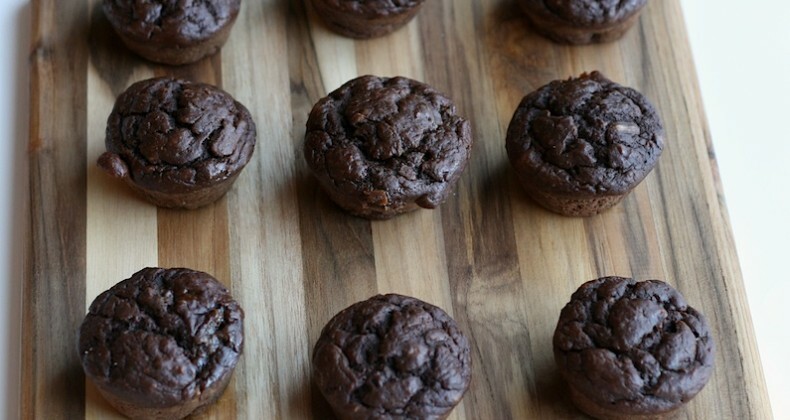 Â Now chocolate banana muffins are a completely different thing. A delicious thing. I hope you give this recipe a shot. But I am very happy with these chocolate banana muffins! These would be great for a breakfast on the go! WOW!! I am on board with this muffin. Love chocolate and bananas and the calorie count is just a deal sealer. 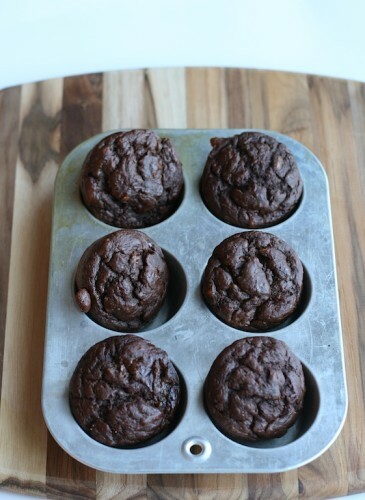 Mmm these muffins look so chocolaty…love! I’ve made these twice now, and they’re a hit. Second time making them, I made sure the bananas were super ripe, cut back on the sugar to 3 tablespoons, added 1 tablespoon of honey, and threw in 1 teaspoon of cinnamon. I also cut the flour back to 1 cup and added 1/4 cup of vanilla whey protein powder. Super tasty and, so far as muffins go, pretty healthy. I’ve never used whey powder before but I like the idea of a protein packed breakfast muffin or snack.